Today’s post is the third in a series of articles written about the real estate buy and hold investment strategy. After writing The Return of the Real Estate Buy And Hold Strategy and the follow-up Real Estate Buy And Hold Case Study, today’s promised article will be a real-world, actionable piece on implementing the strategy today. In order to show the reader the effectiveness of a real estate buy and hold strategy, I have spent a total of 5 minutes looking for a property in the Tallahassee MLS (Multiple Listing Service). This might not be the best deal to be found, but the point is that in literally “no time flat” I found a property that if purchased, would return better than 20% on an annualized basis to the investor who purchased this property. Can you imagine what could be found with a full search of the entire market? Before I identify the property for analysis, I want to review the basic foundation of the buy and hold strategy, as well as identify the assumptions that are required in order to produce the property analysis. Note: The short video below explains the entry and exit point strategy for the real estate buy and hold investor. The simple strategy that we will explore with this blog post requires us to buy a property (today) when values are trading below replacement costs and then sell it in the future when the market value meets or exceeds replacement costs. The buy and hold real estate investor anticipates that long term population trends will rise, construction costs will rise, and that the normal “rules” for supply and demand will continue to govern the market cycles in real estate, thus this opportunity will arise in a future market cycle. The process of selecting a property for a real estate investor with long-term hold plans is rather simple. We want to choose a home or commercial property that can be purchased well-below it’s replacement cost and which will provide a steady income stream during the period of ownership. To ensure that continuation of income streams, one must have a keen grasp of the local market conditions as well as the underlying drivers for growth. I would not recommend buying outside of a market area in which you or a trusted real estate professional is not active. The property pictured here is a short sale listed in Tallahassee for $65K. It is within a short driving distance to all three major colleges and features 2,050 square feet of heated and cooled living space. With five bedrooms and 2.5 baths, it will be a great revenue machine for the real estate buy and hold investor. I have not visited the above property, so I am going to assume it needs a good bit of work. It is located in a fairly good student-rental section of Tallahassee, so an asking price of $32 per square foot makes me believe it needs some signficant renovations. For the purpose of this analysis, I will anticipate paying full price, plus closing costs, plus roughly $30K in renovations for a total acquisition price of $100,000. My assumptions are listed on the right, and please note the very conservative nature of the assumptions. Specifically, operating expenses will run at 55% of collected rents and rents will rise at a 2% rate (consistent with inflation). Finally, I assume the Tallahassee housing market will recover in time for the home to be sold in 10 years at a price consistent with the cost of replacement. After running the numbers on this investment, we find a wonderful opportunity featuring a 30%+ internal rate of return on our $20K leveraged investment. The following table shows the anticipated cash flow estimate. Even if the up-front renovations are double our estimate of $30K, the annualized return on investment still exceeds 30%! 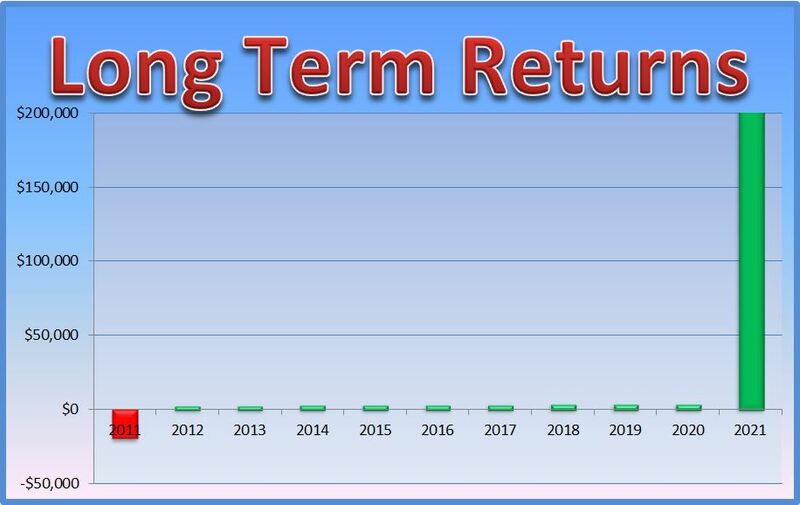 The benefits of a long-term hold plan show through with leveraged appreciation, and so long as the investor has not created a “must sell” scenario, then returns like this will be plentiful as we sit at a market full of great buying opportunities. Thank you Olivia, and yes there is a lot of quality information at BiggerPockets. I hope you take some action! I have enjoyed all three of the posts related to a buy and hold strategy. Its refreshing to be able to see the data analysis in this latest example as well. It really hones in on what the true numbers of a real deal look like. You are welcome Kevin. For me it is fun, because during the boom of the market, finding deals like this was very difficult. Now they can be found in most markets around the US. Your example appears to include the mortage payment as an operating expense. It is a cash flow item but not an operating expense as I was taught. Educated as an accountant with a CPA designation, I am enraged wiht the liberties taken in redefining terms. You IRR table is misleading as it shows the mortgage line in addition to expenses but does not deduct it at arriving a cashflow. Assuming the expenses are expenses and the P&I are additional reductions at arriving at cashflow then the IRR is cut in half. Still excellent but not the shock factor the article implies. In addition, this is the IRR on the leveraged investment not the IRR on the total funds invested. Again that result would not have the shock factor you are tyring to communicated! rdg, thanks for the heads up on the error, it’s been fixed. Educated as a real estate investor with an MBA equivalent of your CPA, I am surprised at your assumption of conspiracy. Did it ever occur to you that it could be a simple error in my spreadsheet? This is a blog, not a scholarly journal. If you find errors, let the author know and see what changes that might bring. The error has been fixed. The conclusion is the same. It’s sound. It’s smart. It’s solid. I hope you’re not shocked.